I've been researching Social Security retirement benefits so I can better understand how these benefits might interact with other sources of income and how they could affect taxes. I've learned that delaying Social Security benefits until age 70 could mean a larger monthly check for the rest of my life, though I'd miss out on earlier payments. I've also found that I could owe taxes on my benefits if my combined income exceeds a certain threshold. And there's more to learn. 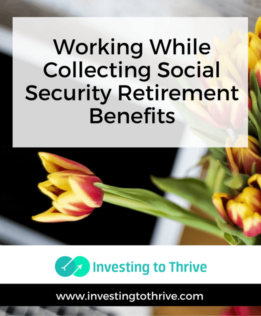 Recently, my husband posed this question: “can I work and collect Social Security benefits?” I didn't know the answer at the time but discovered that, in general, “yes.” But a more important question is: “should I work and collect Social Security retirement benefits?” The response to this question required additional research. For the scope of this article, I won't delve into the nuances of how working could enhance a sense of well-being and purpose or how the costs associated with working (commuting expenses, for example) might detract from its financial value. Instead, I'll consider how working while collecting benefits could affect 1) monthly paychecks received in the present; 2) Social Security retirement benefits in the future; and 3) income taxes. If I've reached full retirement age (FRA) or normal retirement age (NRA), I can collect my Social Security retirement benefits and continue working with no impact on my monthly checks. FRA (aka NRA) varies by birth year and month according to Social Security Administration (SSA) rules. For those born after 1960, FRA is 67, not the typical retirement age of 65. Check out this chart to determine your FRA. Another aspect of the working-and-collecting-benefits question is taxes. If my “combined income” is over a certain amount as specified by the IRS, I'll owe taxes on Social Security benefits. Combined income is calculated by adding my adjusted gross income (AGI) and nontaxable interest income to one-half of my Social Security benefits. Working and earning income could increase my AGI and trigger taxes on Social Security benefits. Thresholds for when combined income leads to greater taxes depend on IRS filing status. If my husband and I have a combined income that is greater than $32,000 and we file a joint return, we'll pay income tax on up to 50 percent of our benefits; if combined income is over $44,000, up to 85 percent of benefits will be taxed. For individuals, combined income limits start at $25,000. For more on taxing of Social Security retirement benefits, see this tax planning page by the SSA. The rules for collecting Social Security retirement benefits while working prior to FRA are complex. There is a distinction between a) collecting benefits when I haven't reached FRA for the entire year and b) collecting benefits during the year in which I reach FRA. In both situations, there are annual limits on earned income; if these limits are exceeded, monthly checks are withheld. The money withheld is to be returned at a later date. First, I'll consider what happens to my Social Security checks during the years when I won't reach FRA. If I earn less than the annual limit or exempt amount ($16,920 in 2017), my Social Security payment won't be affected. However, if I earn more than the exempted income, one dollar of my earnings will be withheld for every two dollars over the annual limit. The SSA won't simply adjust my monthly check. It'll send me either the entire benefit amount or nothing, and make up the difference in the following year. My annual earnings are projected to be $22,000 (The SSA draws on past earnings records or an estimate for its calculations). SSA will send the monthly check for $600 from June through December (months 6 through 12). According to the SSA (see pages 6 and 7 of this brochure), the dollars withheld while I'm working and collecting Social Security benefits will eventually find their way back into my monthly checks. When I reach full retirement age, my monthly benefit is to be recalculated to include a repayment of the withheld amount. An article published at Nolo.com indicates that lost benefits are repaid over a period of up to 15 years. Following the example in the brochure, the 15-year timeline seems accurate. In this situation, $11,568 is withheld ($964 x 12 months) and then repaid with a monthly check of $1,029, which is higher than the usual payout by $65 ($1,029 – $964). Over 15 years, an extra $65 totals $11,700 ($65 per month x 12 months x 15 years = $11,700), close to the original amount withheld. In addition, my future benefit base could be higher than $600 due to increased earnings while working, not simply a return of withheld paychecks. This year's earnings — if higher than previous years used in benefit calculations — could increase my monthly retirement benefits from the SSA. Next, I'll consider what happens to my Social Security checks during the year I reach FRA. If I earn less than the annual limit ($44,880 in 2017), my Social Security payment won't be affected. However, if I earn more than the limit, one dollar of my earnings will be held for every three dollars over the annual limit. My monthly benefit check is $600. My annual earnings are projected to be $45,900. SSA will send the monthly check for $600 beginning in February. Again, I'll get back the monthly checks withheld eventually. And my earnings in this one year could boost my retirement benefits over the long term. Here's a tool to estimate a benefit reduction while working. Social Security benefits could also be taxed depending on my AGI and other factors. Fortunately, my husband and I won't have to work and collect benefits in order to handle expenses — unless our financial situation changes drastically in the next few years. Still, I could imagine needing more than regular earnings to pay bills. The idea of collecting retirement benefits early could seem like a reasonable solution to budgeting needs. If earnings fell under limits, I'd be able to work and get a retirement paycheck. In reality, however, several checks could be withheld due to “high” earnings so starting benefits early may not make sense if I'm still working. I may not get a check when needed due to SSA procedures, causing the cash flow problems that I would be trying to avoid. Further, the money I didn't receive in the one or two years I worked would be repaid over 15 years … without interest. If possible, it'd make more sense to pay down debt, hold cash, and invest prior to entering retirement. In this way, monthly expenses could be more manageable. Excess cash could cover shortfalls between earnings and expenses. Investments could be sold to pay certain bills if needed. What do you think? Have you worked and collected Social Security benefits for retirement? Are you making plans to delay the start of benefits? I was just talking about this with my brother-in-law the other day. He will be 65 years old in February and will be retiring the day after his 65th birthday. He was concern about SSS and his small pension from his employer not being enough to have good retirement years. He’s talking about getting a part-time job at a local Walmart starting next summer. It’s a sad truth but I believe this is pretty much the norm in our society. Thanks for this post. Will definitely forward this to him. Thanks for reading. Hope the article helps as your brother-in-law continues to plan his retirement.